At the age of 77, Madame Nguyen Thi Oanh would like to retire and tend her garden in her quiet compound outside Ho Chi Minh City, Vietnam. However, this is not what fate has in store for this dynamic woman. “I would like to retire, but my colleagues need me,” she says, referring to the next generation of social workers in Vietnam. Dramatic changes in social work in Vietnam have called this teacher, social activist, and popular advice columnist for teens in one of Vietnam’s largest newspapers out of retirement. In Vietnam’s university system, it has only been in the last few years that social work has been reinstituted as an accepted academic discipline, previously having been removed at the end of the war. Presently, there are more than 30 social work programs in Vietnam offering undergraduate degrees and no institutions offering a graduate degree. It is estimated that only 50 to 60 people hold MSW degrees in this country of 85 million people. Oanh, with her experience in social work, is a valued resource. There are few social workers in Vietnam that do not know her, and most social workers are her students. She consults, nurtures, helps organize social workers into a voice, and is always pushing for opportunities for social workers to receive more education, whether through workshops, scholarships, or advanced degrees. Although Oanh is one of the most prominent figures in Vietnam, her career has been filled with many hurdles and challenges. Her life as a social worker and activist is a product of circumstances and an unshakable belief in the good of humanity. In Vietnam, 1954 was a pivotal year. The country was divided into north and south after French colonial forces were defeated. Oanh was asked to return home after studying in the United States for four years. She worked in a hostel for misplaced girls. The move marked the beginning of Oanh’s involvement in social work and activism. Soon after, she began working as a Catholic Relief worker helping settlement communities for refugees from North Vietnam. In 1968, with the assistance of the United Nations, she helped establish the first National School of Social Work of South Vietnam in Saigon. She continued to teach social work until the communists reunified the country. The postwar years were the hardest for Oanh. She was accepted as a socialist sympathizer and antiwar activist, but there was little trust of social workers in postwar Vietnam, especially those from South Vietnam. “It was a challenge, but it taught me a good lesson: that I must persevere and that I must hold to my belief in Vietnam,” says Oanh. Social work was not recognized as a profession in the socialist state. Unemployed and isolated, her only support came from family members in America. Oanh questioned her beliefs and her life’s direction but never her desire to serve her country. On more than one occasion, she was offered a chance to leave Vietnam, but she wanted to stay with her people and help rebuild the war-torn country. Oanh’s desire to serve her community motivated her to remain active in the face of these new circumstances. She participated in intellectual circles and engaged in social activism to promote awareness of social issues during the first five years after the war. Oanh began teaching again soon after Vietnamese independence and later became a “freelance” social worker. She was invited to train workers in teamwork, communication, and leadership. In 1989, she founded the Social Development and Research Center (SDRC), a social work resource organization serving social service agencies and international nongovernmental organizations (NGOs). The SDRC has contracts with a variety of NGOs and published more than 75 reports and assessments for government organizations, international NGOs, and other nonprofit organizations. Three years later, Oanh helped to reestablish social work as a profession. The Women’s Studies program at the newly founded Open University in Ho Chi Minh City (Saigon) established a social work minor. And after 12 years, in 2004, social work was finally recognized as an academic field. Universities in Vietnam could begin social work programs; however, they lacked trained faculty, field placements, and textbooks. Oanh works closely with international NGOs and foreign universities training a new generation of social workers. 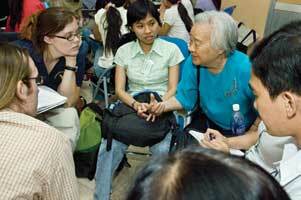 Recently she helped establish a café in Ho Chi Minh City where social workers gather for informal discussions. “The café is a place were social workers can experiment, brainstorm, and innovate. Finding an innovative approach is important because social workers are live innovators,” she explains. 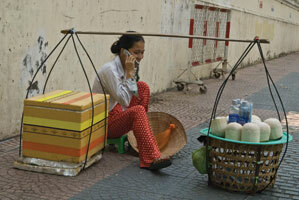 Social work in Vietnam still faces hurdles such as societal barriers and the lack of a trained workforce. “We have to move people from thinking it is about charity to knowing it is about justice,” says Oanh. Organizing community networks that view problems not as individual disparate issues but as connected and requiring systemic solutions will best achieve justice. Bringing change to society is no easy task and certainly not for one person. 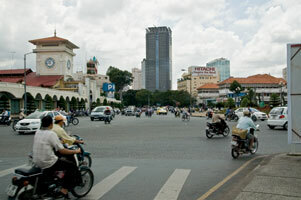 It still drives Oanh today as she seeks to rebuild the field of social work in Vietnam. “I always taught during my years at the university that a social worker must be more than a social worker but also a change agent,” says Oanh. For more information on the SDRC, visit www.sdrc.com.vn. — Andrew Barnes is a graduate student in journalism at the West Virginia University Perley Issac Reed School of Journalism.